I have fallen into a bit of lull with the restoration of the 1967 E-Type 2+2 over the last months, what with Concours duties and the call to the race track with my Porsche 944. But this fall I have finally gotten back into work on the interior. Following is a bit of photo essay on my recent upholstery work. My upholstery kit came from BAS Ltd, Vancouver, BC. 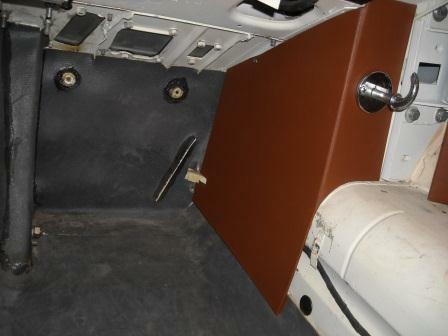 First, I would to mention the door panels. If you have to take one apart, first take off the handles and door pull. Then carefully work under the bottom and rear perimeter of the door panel to pry out the spring loaded clips that stab into holes inside the door frame. The bottom panel separates at the upper chrome strip by pulling downward. This will reveal screws that hold on the upper panel. 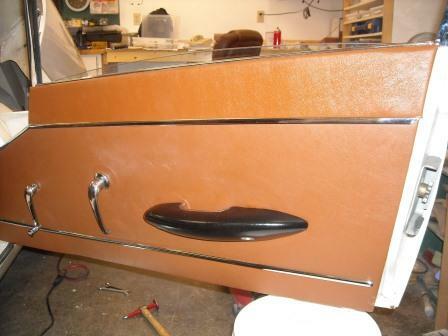 The door panels are made by BAS but you need to salvage your chrome strips. On the right and left side foot wells are pre-formed panels made by BAS. These are held in by the hardware for the bonnet release and, as far as I can tell, a random sheet metal screw down near the end of the foot well. The carpet, when installed, will lap over the edges of this panel. 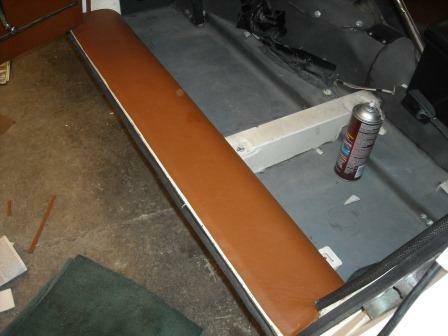 Next, I glued closed cell foam and vinyl to the door sills. You may have to fuss with the wiring looms to keep them from pushing out and being unsightly. At this point, I stopped to make sure the radio console fit properly. My goal was to enable the center panel to fold down correctly, for access to the fuses, yet not have an unsightly gap between the center panel and the top of the radio panel. There are a lot of anecdotal complaints in this regard. 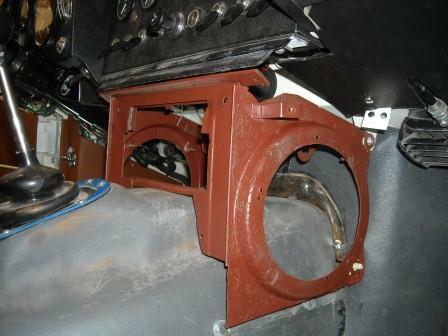 My Koolmat installation had raised the thickness of the transmission tunnel cover by about 1/8″ but as found, the metal of the center console required significant fettling. I had to revisit this issue several times during the install. 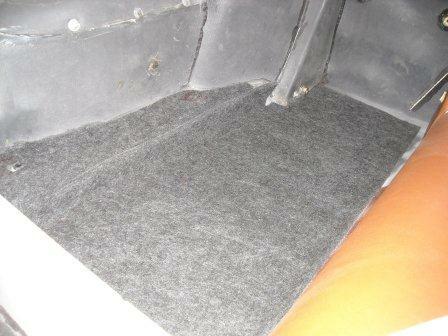 Next I started laying in the felt carpet underlayment and gluing it down with contact cement. Here the various carpet pieces are installed. BAS applied the trimmed edges. Generally a trimmed edge will overlap an untrimmed edge. The center arm rest and storage cubby were next. The top of the cubby was pre-fabricated by BAS. Note that the large pieces of carpet on the floor have some plastic tabs that engage brackets welded to the floor structure. 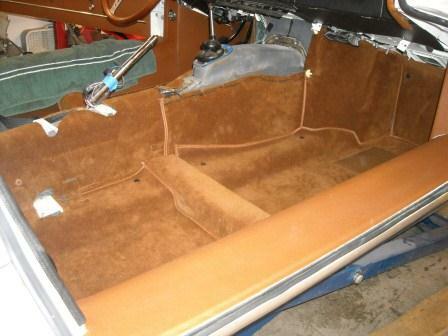 You’ll also want to identify the mounting points for your seats and cut away the carpet and pad in these areas. It’s really starting to come together now.